One of my favorite spring traditions in the Midwest is the start of baseball season! 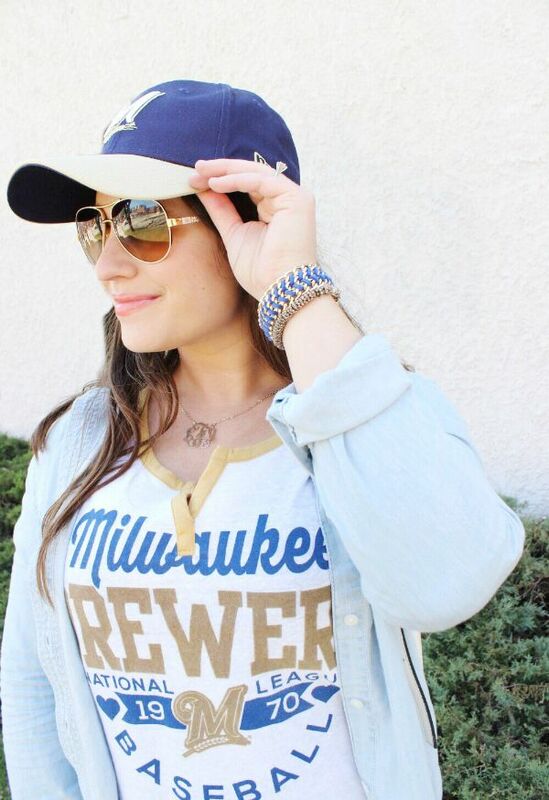 Catching a Milwaukee Brewers at beautiful Miller Stadium is a not-to-be-missed activity on your next visit. For me the tailgating, sausage races (it's a Wisconsin thing guys! 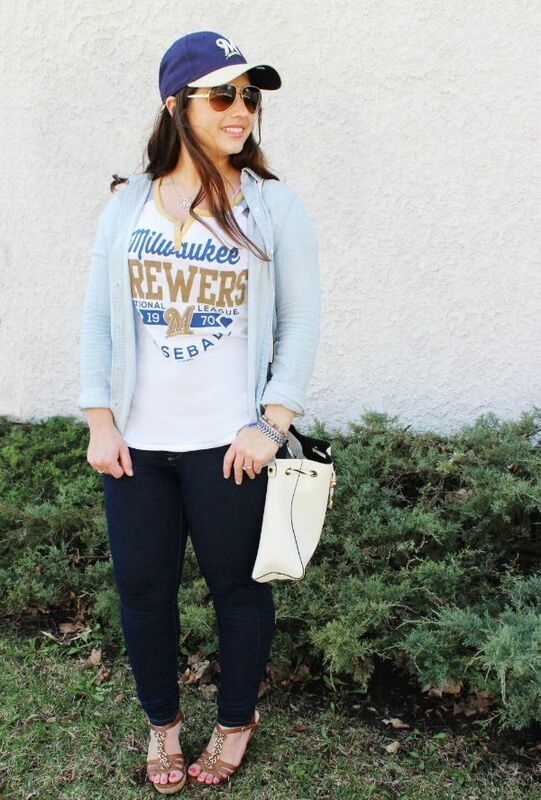 ), and choosing a comfy but chic game day outfit are just as much fun as the actual baseball game. Growing up all of my guy friends played baseball so I have SO many fond memories of sitting in the stands on summer evenings. 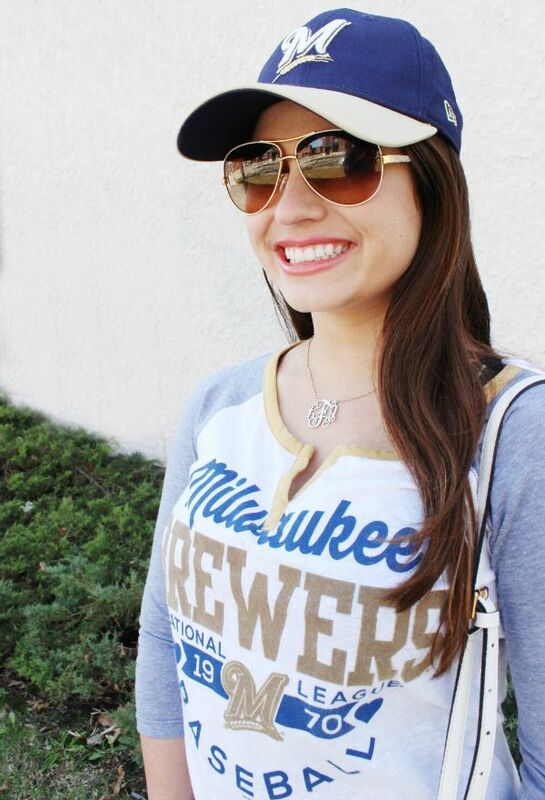 Today is opening day for my home team and though I'm not there in person- I'll be wearing my Brewers gear in celebration and planning my next baseball road trip with friends. 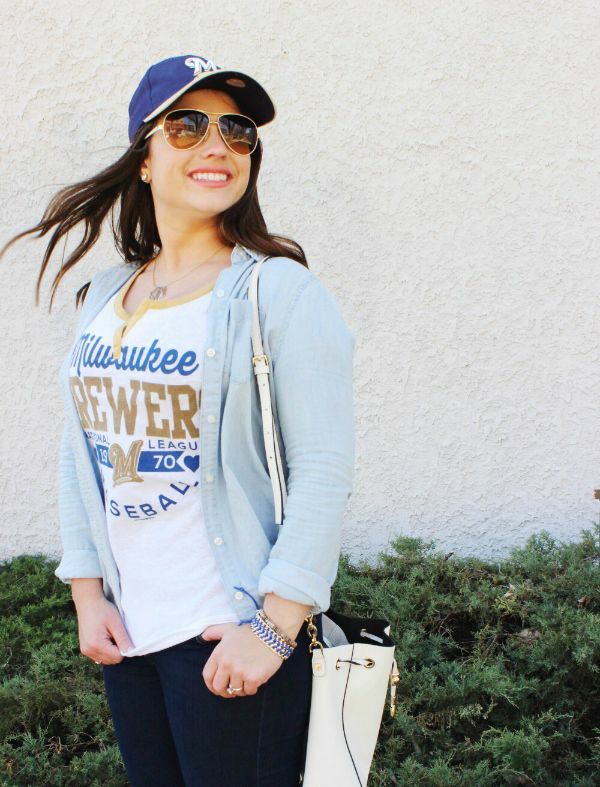 I've teamed up with Gordmans to share how I dress in style while cheering on my favorite Major League Baseball team! 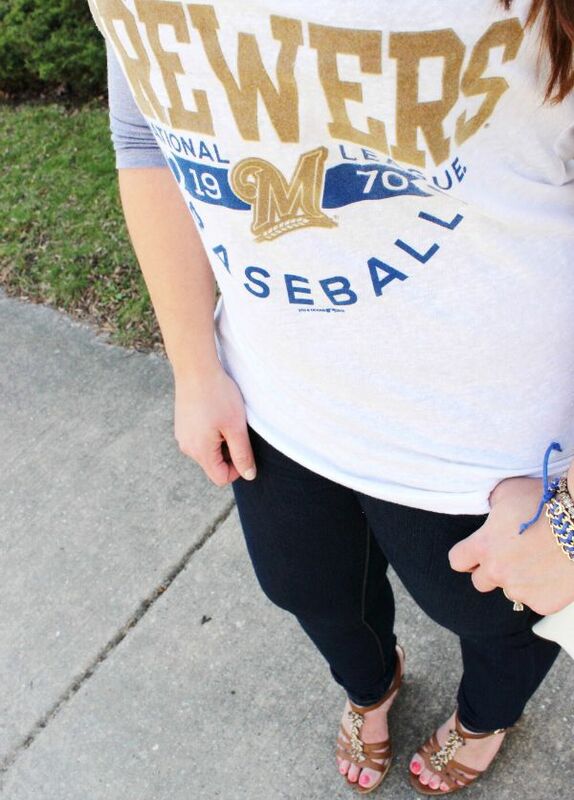 This 3/4 length baseball tee is lightweight but perfect for the still-chilly spring weather we've been experiencing. I've layered it with a chambray shirt for extra warmth. A cute team baseball cap (this was one was on sale for $11 at Gordmans!) keeps sun out of your eyes so you won't miss a single play on the field. The wedges are super comfortable for a long afternoon of tailgating but help make the look equal parts sporty and chic. Whenever I'm headed to a sporting event I like to balance my athletic wear with stylish accessories in team colors. 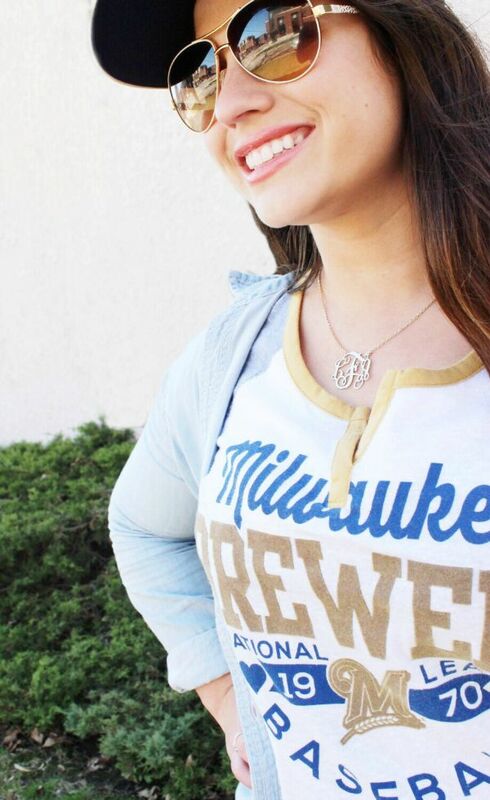 For the Brewers game style I've opted to a blue chain bracelet & white bucket bag (perfect for storing lip gloss for a 3rd inning touch-up or a sweater for the evening). 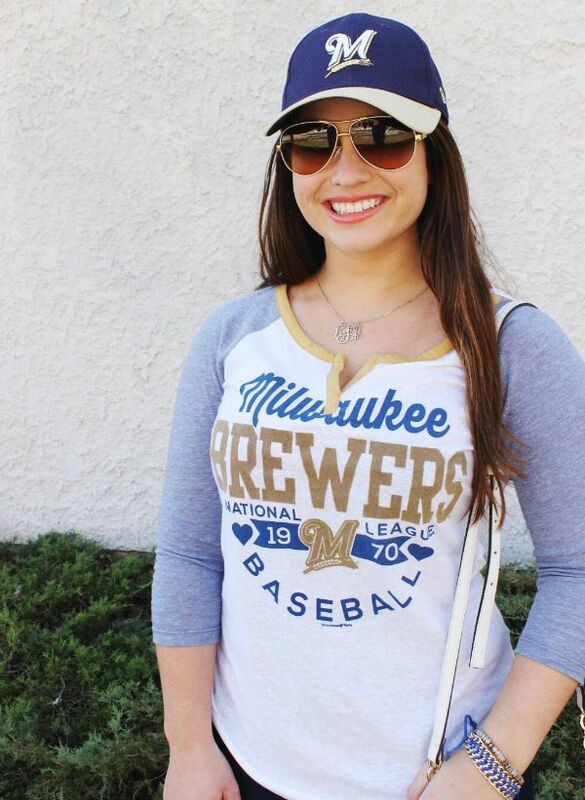 Be sure to check out your local Gordman's for great deals on stylish clothes for your favorite baseball team! 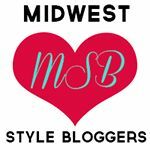 Be sure to check out these blogger babes' baseball style! What's your favorite baseball season tradition? 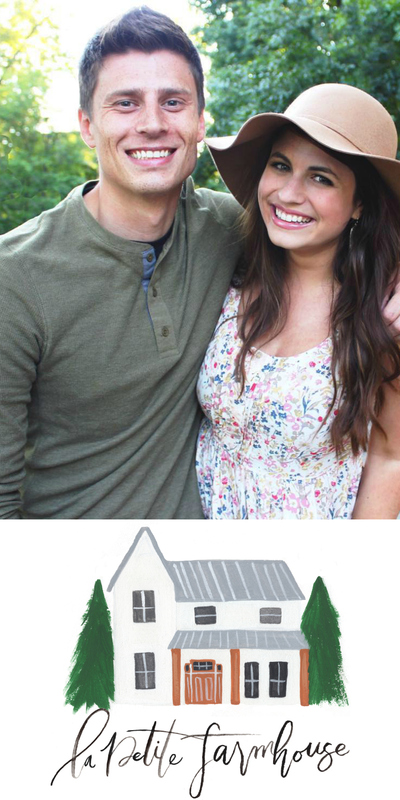 Disclosure: Thank you to Gordmans for sponsoring this post! All opinions are my own. Get it girl! 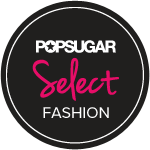 I love your pick of the top! Got to love the brew crew! They're my fav team, can't wait to catch a game in June! This is definitely sports chic. I love wearing team colours when I'm at a live sports event.